It’s as you were at the top of the table as Hibs, Falkirk and Rangers each picked up a point, but it was an opportunity missed by Falkirk. A late Martin Boyle tap-in snatched a precious point for ten-man Hibs who had John McGinn sent off just before half-time. 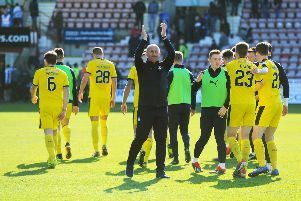 However it had taken Falkirk until the 85th minute to finally breakdown the home side with Lee Miller capitalising on a Mark Oxley blunder to finally prod the Bairns ahead after they had controlled the second half with their man advantage. They thought they were going to their Christmas night out in Dublin with three points gained and the gap at the top sliced, but with time running out Henri Anier flicked a ball across goal and Boyle scored from equally close range to secure a point which matched Rangers’ gains from a 2-2 draw at home to Morton. Easter Road saw an entertaining first half with a lot of quality, but no goals, despite Hibs’ plethora of goalmouth chances. But the game changed on the red-card. Hibs packed men behind the ball and Falkirk toiled to break them down. It neutralised the game and until the introduction of Miller the game was in stalemate a contrast to the first half when Falkirk defended well, desparately at times and on a couple of occasions were only spared by deflections round Danny Rogers’ goal. However the Bairns’ build-up play was of a high standard, spreading from wing to wing and the passing exchanges ashould have brought more goalmouth opportunities than they did before the break. Kevin O’Hara, making his full debut did not look out of place chasing down the home defence and getting invovled and contributing to the Bairns moves. Blair Alston should have been clear through on goal after 21 minutes in probably the best chance but he was hauled down after spinning John McGinn on the edge of the penalty area. John Baird’s free-kick was tame and straight at the wall. However for all Falkirk’s build-up it was Hibs testing Danny Rogers regularly and he defied James Keatings twice and once fortunately when the ball squirmed out of his grasp and narrowly round the post. Another effort, this time from Hanlon was deflected inches widfe at the other side of the goal by Peter Grant and Rogers again was to the rescue by tipping a John McGiunn shot onto the side netting when the midfielder cut in from the right-wing. That came on 39 minutes and shortly afterwards he was up the tunnel for a two-footed lunge on Marek Kerr which left the veteran Bairns midfielder in agony just before the break. Kerr became a target for the home supporters, but ref Kevin Clancy overtook him as subject for their ire with several infuriating decisions for the home side. None proved costly though and as Falkirk edged forward they were constantly repelled until the 85th minute when Will Vaulks jinked left and right inside nthe box and laced a pass to Blair Alston. It was on target but lacked power and Oxley was down smartly to stop it, but he couldn’t hold the ball and Lee Miller prodded in the opener and what looked to be the winner. The game was extended by longer after a collision between Alston and Lewis Stevenson and the latter was forced off but without their captain and catalyst in McGinn Hibs STILL managed to summon an equaliser when Boyle tapped in from close range after Anier’s crafty backheel.